Events will differ greatly in the amount of equipment needed. For some events the amount of equipment needed is very little such as a soccer match while in other events the equipment for competitors may be worth many thousands of dollars. In some cases it is the competitor's responsibility to provide their own sports equipment e.g. Track Cycling or Canoeing. In other events, it is the Event Director's responsibility to provide equipment for competitors e.g. Weightlifting Tournament. Whether equipment is supplied by event organisers or participants, it is often the Event Director's responsibility to provide a secure lock-up and even to employ overnight security staff. In one true story, organisers of a Football Carnival utilised a volunteer to keep vigil over large tents overnight. On the last night, it rained very heavily for a few hours in the evening. The volunteer thought the tents would be safeduring the rain storm. 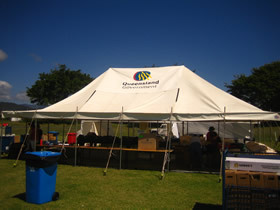 On arrival at the venue, he found that one large marquee tent was stolen already, and the thieves had pulled pegs out of the ground of another but had obviously run off when the volunteer arrived. Where there is a requirement on the part of the Event Director to provide specialist competition equipment, efforts to locate such equipment need to be undertaken from the earliest moment as it impacts on the feasibility of the whole event. Event Directors should anticipate that equipment may need to purchased and imported from overseas. Extra time needs to be allowed for transactions that involve parties in different nations. Where equipment is required in urgently the cost can increase dramatically due to the necessity to use air freight.